Perhaps I misunderstood you - why do you think that no-one can know if the decision to attack the Syrian sites was the right one? Have you seen Flint Town on Netflix? Fascinating doc showing just how impoverished and downright dangerous some parts of America are to live in. Well worth a watch. As to Syria, it does look like a proportionate response, provided there is 100% certainty that it was actually Syria that dropped the chemical weapons. Probably a lack of clarity on my part. It just strikes me, in this particular case, given the messy complexities of the situation, the conflicting assertions of all the actors, and the apparent lack of verifiable evidence on the face of it, that it's nigh-on impossible exactly what to think - I'm just expressing exasperation at the whole thing really. Perhaps the coalition's action will be (is?) vindicated - I hope so; and it's interesting that the Russians' response was effectively to mutter disapproval under their breath rather than, for example, strike our air base in Akrotiri. One thing is for sure, the answers don't lie with the hand-wringers of the regressive left (such as Chakrabarking on this morning's news); if that lot were making these decisions we really would be screwed. A lot of judgements have been clouded on this issue by the complexity of the situation. There may be an element of guilt that Obama looked the other way when his line was crossed so blatantly. It alters nothing to consider it but it was a missed opportunity to act before Russia became such a major factor. The limited nature of the strikes suggests that this is just gesture politics from the alliance. At best, an inconvenience to the regime, at worst a boost to the jihadist's cause. Demonstrates, yet again, that the (new?) left would never be prepared to make big decisions around committing our forces. The strike was legal in international law and any grizzling about parliament being given a say just displays the lack of a backbone from Corbyn et al. Emily Thornberry, on Peston, would not confirm that Labour would ever take action, regardless of irrefutable evidence.The fact that Macron has taken a lead has taken some of the wind out of the left's sails for sure. I accept that there's a case to answer for the PM and cabinet taking this action without parliamentary approval, but as I understand it, it is not actually required. I suspect a bit of all three, but I accept that she didn't actually need parliament's approval either. The office of Prime Minister entitles her to take the responsibility for these decisions herself. I can accept a bit of disquiet about it from the moderate left, but I find the hard left's objections extremely hypocritical and distasteful. It seems to me that Corbyn, Abbott, Provo McDonnell and the rest will always view any military action through a leftard lens in which the West is necessarily the brutal bad guy, helping itself to a bit of imperialistic aggression. Compare and contrast Corbyn's reaction to the government for carrying out these strikes, in which as far as we know no-one was even injured, to his reaction to a terrorist group deploying a large bomb aimed at murdering the British cabinet, in 1984; an action which killed five people, and which was carried out without the democratic consent or approval of anyone except themselves, a criminal gang. No hand-wringing anger on that occasion, oh no. Instead he invites a few of them round to the Commons, and he's been on friendly, supportive terms with them ever since. 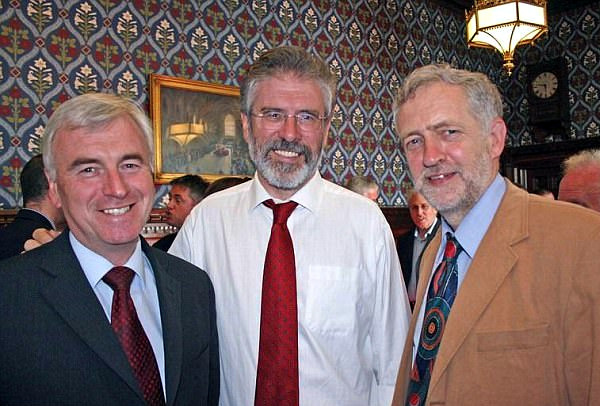 I'm afraid the blunt truth is that Corbyn and friends would never support any form of armed action taken by their own country. Only against it. It's unbelievable that some are giving Corbyn a realistic chance of running the country. Are we happy then to watch people get dismembered and blown to pieces in Yemen rather than choked to death in Syria? 1. Trump already told the Syrians, the Russians and the rest of the world of Twitter that the bombs were coming. It's generally accepeted that the Russiians were warned of the targets so that no Russian personel were harmed. Agree, it's the Tory reserve team on the park at the moment. That's good old proper dismemberment and blown to piecesism. Not being gassed, completely different kettle of fish. As distasteful as it may be, dropping high explosives on people or riddling them with machine gun bullets isn't a violation of an international convention, providing they are of course "collateral damage". I would say that, if it could be shown that civilians were unambiguously being deliberately targeted in Yemen, even with 'conventional' weapons, then the international community should act to deter it. But a failure to do so in that case doesn't make a failure to act in Syria right. I mis-worded my third point, because of course that approval wasn't "necessary". And that's the point - doesn't matter if parliament doesn't like it, she and the cabinet have the right and responsibility to take that decision for themselves. And that's what Cameron should have done in 2013, as well. I was heartened by the number of Labour MPs who spoke out in support of the government yesterday, but I assume many or all of them will be deselected to make way for mouth-breathing leftard extremist class warriors, eventually. Yes, indeed, both wonderful in their own way. Surely an MP swap is needed - Chris Leslie for Ken Clarke?